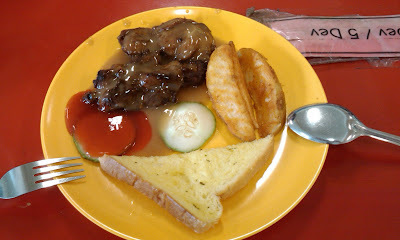 Contents: Chicken Chop with gravy, potato wedges, buttered garlic toast, cucumber slices and a squirt of chilli sauce. Notes: "This meal was purchased in a primary school for $2 (about USD 1.50). This is an 'upsized' portion. The regular student portion probably has one piece of chicken and cost $1.50 (USD 1.15)." That's cute. "Chicken chop" :) Like Pork chop. Looks good to me, except for that too-red sauce. Either it's crazy spicy and it's the natural colour, or they added something to it. That too red sauce, it's chili/ ketchup sauce.